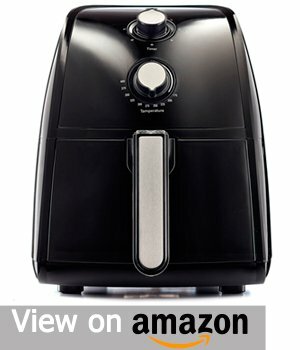 6.1 What is an Air Fryer? In the information age, gadgets come and go, some are useful and some rather gimmicky. One of these, which has been continuously gaining in popularity is the air fryer which is supposed to be a high-tech alternative to traditional deep fryers. But are you really aware of its benefits and advantages over the tried and true method of deep frying? Should you even spend your hard-earned money on such a device? Also, how do you decide which is the best air fryer? In this comprehensive review, we will tell you all of that and more. After searching from a heap of fryers on the market, we finally concluded these 10 fryers, which proved to be the best option till now. Various factors were included in our selecting criteria. This helped us to exclude the obsolete options available on market. Here are the top-rated air fryer recommendations. The HF110SBD comes from none other than Black+Decker, a company that has successfully made a name for itself in other niches and has now ventured into the territory of air fryers. The HF100SBD, their flagship product, is designed to capture the attention of almost any kind of buyer. With its unique egg-like oval shape and round 2L basket that slides out of the main body it certainly looks the part. The price-performance ratio is admirable as well at just $99 the Black&Decker isn’t a bargain but sits below the price point of many other luxuriously crafted fryers. In terms of features, there is not a whole lot to choose from but the great thing about the HF110 is that you don’t need to. Simply set the timer and temperature via the two well-crafted knobs and off you go. Good non-stick materials, a so-called ‘Cool-touch Handle’ and a sturdy build with many elements of the device made out of stainless steel are a few of the many unique amenities that the fryer has. Of course, the most important aspect to determine an air fryer’s quality is the consistency of the fried food and how it compares to traditional deep frying. 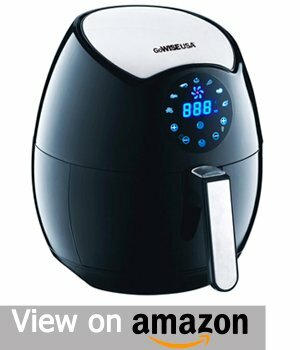 If the fryer makes any sort of a compromise, it isn’t really worth buying, or is it? Fortunately, the HF110SBD is really good at frying any kind of food, rather quickly, not just that, the taste is quite comparable to its competitors as well as deep fryers in the same price range. The maximum frying time of 60 minutes allows for many different kinds of meals, as does the included separator which divides the 2L into two 1L sections. This way two meals can be fried at the same time without accidentally inter-mixing them. On the whole, the Black+Decker is a formidable performer, for a good price. What’s not to like about it? Well, nothing is flawless and that applies to the Black&Decker as well. For example, the black glossy paint used on the fryer has a habit of showing each and every fingerprint which, after some time, makes it look low-quality and heavily used. Also, some foods retain a slight chemical taste to them when fried for more than 15 minutes or so. The tiny font used on the control knobs could be a little larger as well. Not to mention the rather small 2L basket which becomes even smaller with the included albeit helpful separator. And finally, the cooking speed could be a little bit better. 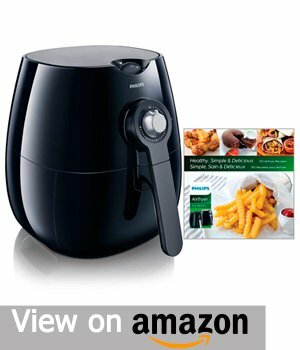 In conclusion, the Black+Decker HF110BSD is one of the top fryer deals on the market right now. Thanks to a sturdy build, good capacity—especially with the separator feature, a great choice of non-stick materials and truly competitive pricing. There are very few reasons to not consider getting this machine. We hope that these few reasons will be addressed in the future as the HF110 is still far from perfect. The Secura 1500 named after its maximum output in Watts can’t stand on the shoulders of its manufacturer’s reputation like the Black+Decker HF110 above can, but thanks to great performance, it doesn’t need to. With a huge 4L removable basket it’s got enough space for almost any meal. Unfortunately, the Secura does not have a separator, even though its extra large capacity would have greatly profited from just that. Apart from the basket, the Secura’s specs closely mimic those of its Black+Decker rival. For instance, on the B&D, there are two control knobs for temperature and timing just like the Black+Decker. The maximum cooking time is, again, 60 minutes and even the temperature range is almost the exact same as on the HF110. Design-wise the Secura also borrows a lot from the competition featuring a very similar egg-like oval shape for both the main body as well as the 4L basket. However, the similarities at hand don’t mean that the S1500 has got nothing up its sleeve. On the contrary, it is equipped with numerous extras that you won’t find anywhere else in the same price category. For example, the Secura comes bundled with a toaster rack and some skewers, handy tools to have that you would otherwise need to buy in addition to the fryer. Thanks to a built-in pan, you can even bake food with it. Also, on the Secura’s main body, the temperature and time settings for various popular meals are engraved in white-on-black print. Neat! But how does the food taste when prepared with the Secura 1500? After all, even the most feature-filled device in the world would be useless if it couldn’t fulfill its actual purpose. Luckily, though the Secura wins on this front too as no matter what you like to eat, the Secura will make it crisp, tasty and fresh almost better than the Black+Decker in some ways. You may ask yourself at this point, “Does this thing even have a weakness?”. Well, to answer your question, that’s hard to say. It’s not the price, that’s for sure. At an MSRP of $110, the Secura is just $10 more expensive than the Black+Decker which, considering the features and extras that you’re getting, sounds like a bargain. Perhaps the Secura’s greatest weakness is just that: It’s made by a no-name company. As such, the build quality does leave a bit to be desired. While it looks good from the outside, the body is prone to collecting various signs of use very quickly, like fingerprints, dust, scratches and so on. The rather thin plastic used to build it, doesn’t help either. Add to that the lack of reputation and brand recognition and voila, you got yourself a big flaw in an otherwise great machine. In conclusion, the Secura 1500 is a great performer and is not to be underestimated but the uninspired exterior design, low-quality build and lack of brand recognition will probably convince many to save $10 and go for the higher-quality, more reliable Black+Decker HF110. Still, the Secura offers some features that are not present in any of its competitors, like the bundled extras and 4L XL capacity removable basket. All in all, probably the best option if you’re looking for extra high capacity and high convenience. 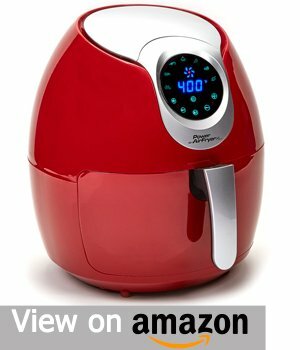 The Cozyna Air Fryer XL by Cozyna as it’s officially named by its manufacturer is a highly unique fryer that is sure to stand out from the crowd. Armed with an almost absurdly high 5L capacity and, originally, a $250 price tag that has since been lowered to $150, this fryer will probably polarize the crowd. Let’s look closer at the Cozyna’s specs. The Fryer XL as previously stated comes with a whopping 5 Liters of capacity and there really is no gimmick behind that. The basket, like most other popular devices on our list, is round but that doesn’t pose any problem, thanks to its enormous size. Other unique features are the very high cooking speed—most simple meals can be cooked easily in a few minutes—and the included cookbook. Yes, you read that correctly- a cookbook! The Cozyna comes with one, which should rather be described as a booklet and it includes some 50 recipes including, of course, the instructions and detailed info specific to the Cozyna. Apart from these extras, the Cozyna is very similar to the two fryers above, the Black+Decker HF110 and the Secura 1500. However, unlike the Secure, the Cozyna is very well-built, using stainless steel for some of its components and thick, high-quality plastic for others. Only the control knobs are a bit peculiar. Whilst they are easy to use and have a nice feel to them, only the topmost knob, the one regulating temperature is labeled and the lower one is left blank. Although the cookbook tells you very clearly which setting should be used what, it would have been nice to have handy descriptions on or next to the knob itself. Cooking with it is not just fast but of good quality. A crisp, fresh taste and the lack of any chemical flavor grace all meals that you can prepare with the Cozyna. The fryer is also very versatile: It can cook, bake, fry, grill, and roast food. The only real drawback is the cost. Though Cozyna has consistently lowered its flagship model’s price tag over the years, at $150, it is still pretty high. Most customers will probably not willingly pay almost twice the price of a reliable Black+Decker model for a larger basket and some nice, but unnecessary extras. Also, just like the comparably large Secura 1500, the Cozyna, completely in contrast to its large basket, lacks a separator, so you can only prepare one whole meal at a time. In short, the Air Fryer XL by Cozyna really is a great performer in almost every way. Like its brethren, though, it is not without flaws. The price even though it has been consistently lowered ever since the Cozyna’s release is still probably too high for most potential buyers. Some standardized lettering for the device’s controls could have really helped, as would a separator option for the huge basket. We hope that Cozyna plans to rectify these flaws, in which case their product would become one of the best on the market. The GoWISE GW2261 is a very peculiar fryer. Let’s start with the price, for example. Originally the GW2261 was priced at about $260, which made it one of the most expensive fryer models out there. Recently, though, that price has been lowered to $95. So now the GoWISE is in the least expensive class of air fryer models. Does that make the product itself any more tempting to get? We’ll see. There are these unique controls. These too are very unconventional. Instead of simple knobs to regulate speed and cooking temperature, there’s a glowing blue-on-black LCD touchscreen display that you can use to select various settings, from speed to temperature to presets for various dishes which are pre-installed onto the device. It’s a handy system and it works well. The question though is whether it’s any easier or quicker to use than traditional knobs which are lighter, cost less and rarely if ever, get damaged. The answer, unfortunately, is no. That is largely due to the layout of the LCD which only lets you change one setting at a time drastically reducing the speed at which you can set everything up. For fans of high-tech gadgets, though the GW22621 has got quite the looks, the rest of the GoWISE’s features are pretty standard. There’s a removable round basket with an optional pot that can hold about 3.5L and the exterior design, apart from the glowing LCD, is very similar to the other fryers that the GoWISE is competing against. Like the Cozyna we already took a look at, the GoWISE comes bundled with its own cookbook, full of recipes for popular dishes. Material-wise it’s quite predictable too. Though the GoWISE unit uses three differently colored tones for its exterior, all of them are made out of either a glossy or matte plastic. Although the materials feel well-made and don’t accumulate fingerprints or scratches too easily, it’s still just plastic. There is a downside to all this. The GoWISE’s rather conservative capacity of only 3.5L isn’t anything to brag about. Neither is the cooking time limit of mere 30 minutes, half of what equally-priced, more well-made fryers offer. The GW22621’s general performance could be better too as it can neither cook particularly fast nor completely free of the strange residual taste. Summarizing, the GoWISE is a rather niche budget option for the buyer looking for an interesting fryer. From its cooking speed to overall quality, including the exterior build of the device, the GoWISE is not perfect by any means, on the contrary, there are far better devices out there. But the GW’s target audience will probably not care too much about that, as they will spend too much time ogling the fancy LCD display. Because that is what matters most when you’re buying a gadget. The 14538 by little-known manufacturer BELLA is a small, cheap and fairly competent fryer for the kind of customer who doesn’t care about specifics and just wants down to earth performance for a cheap price. The BELLA is a fairly compact fryer, smaller in size than many others and designed in a similar fashion to the Secura 1500, rounded but not oval like many other fryers. This also means that its basket is quite tiny as well. The only 2.5L of food can fit inside the basket which might be enough for most but not for everyone. A separator is unfortunately not an option. The same goes for many of the BELLA’s other features. A baking pan? Not included. A handy booklet full of recipes like in some other fryers? Nope. Some preset for common dishes, maybe? No. Any gimmicks at all? Zilch. What you get with the BELLA is the most bare-bones form of any fryer on the market made out of equally barebones if not cheap components. It can cook, fry & hopefully won’t break. If it does, there’s a warranty. That’s it. Whether that’s a good thing or not is up to you. But how can you really go that wrong with only $69? This is the BELLA’s main appeal, the price. Offering one of the least expensive products in your branch or genre is always an advantage as buyers looking for the best possible deal will come to you first. This, and only this seems to be the motivation behind the BELLA. We can’t say that it won’t work, because it certainly does but it doesn’t put the 14538 in a particularly good light when it needs an especially low price to justify the purchase. The BELLA’s most prominent weakness seems to be the lack of any special features to set it apart from the competition. The low cost might seem like a godsend for buyers looking for something on the cheap but a lack of generally useful features, bland design decisions, an obviously cheap build, lacking capacity and accessories and more, fail to justify the purchase. So, who is the BELLA 14538 made for, then? The budget hunter? That would seem to be the most likely answer. How about the simplicity-loving buyer? No, he would choose something more reliable, something more trustworthy. And that really is a way, to sum up, the BELLA 14538. A testament to how the lack of certain features cannot always be a feature in and of itself. The Philips so named as it was one of the first of its kind in the market is one of the more luxury-oriented fryer models. This immediately becomes apparent when looking at the price. $185 is the sum that Philips wants you to shell out for this device. What makes it so special? Well, apart from brand bias and the reputation that Philips and this specific model have, there is a multitude of reasons for this price tag. Let’s start with the design. Exterior-wise the Philips Airfryer doesn’t re-invent the wheel but the style is fresh and rarely found on other models. Instead of the oval-like shape that most manufacturers seem to be going for nowadays, the Philips Airfryer has an almost rectangular style with rounded edges. This also applies to the basket which, brace for it, holds no more than a maximum of 0.8 Liters. This obviously gives the Philips a very small footprint but gravely compromises its compatibility for certain dishes. Moving on, the controls on this fryer are analog knobs just like many other models but these ones are exceptionally well-crafted. The lower knob, regulating the time, rotates like any other, though its metallic surface is much more comfortable to hold than most competitors’ while the topmost knob used for changing the temperature rotates into the fryer’s body giving it a half-circle shape. The rest of the materials on the outside of the fryer are plastic but Philips knows how to package something convincingly and they did just that with this model. Everything feels robust and well-made and the fryer certainly looks the part as well. Also, the cooking performance can speak for itself. Even Gordon Ramsay officially endorses this particular model because of its efficiency. Also included is a very extensive booklet containing a staggering, 150 recipes. Thumbs up for that! However, even though Philips likes to brag about this model being the best-selling and most widely known fryer currently available. There is one big, glaring disadvantage to owning this device. Two, in fact. The first is rather straightforward: The Philips Airfryer is expensive. At $185, it’s not for the people looking for something on the cheap. The second problem, though, is much more critical: It’s not even an air fryer! Yes, you heard that right. The Philips Airfryer is not an actual air fryer. It cooks and bakes food without oil, yes, but it doesn’t fry it. As such, it is best compared to a traditional convection oven, not to other fryers. This deliberate act of misinformation by Philips is sure to disappoint many future customers. Ultimately, the Philips Air fryer is probably the most polarizing device on our list. It’s a fryer that’s not an actual air fryer. This fryer has high quality for a high price but without the essentials. It’s got a book full of recipes. But what about the ability to, you know, fry things? With an air fryer? Add to that, the weight of over $180 riding on your buying decision and you got yourself a device that is sure to disappoint many. The Power Airfryer XL. What a name. The device bearing it is equally full of itself. Designed like a red-and-white portable computer that came right out of a low-budget science-fiction movie the Power Fryer XL is a peculiar little thing. Featuring a similar touchscreen LCD interface like the GoWISE fryer we looked at earlier on, it also forgoes the traditional dual-knob layout and instead puts all control onto the display. In fact, both devices use the same user interface which suggests that there is some third party manufacturing these LCDs for both Tristar, the people behind the Power Fryer XL as well as GoWISE. Tristar labels the Power XL as a ‘6-in-1 model’, a reference to its ability to both bake, cook, fry, steam, saute, grill and roast food. This is perhaps also its greatest redeeming feature. The XL is also available in two basket sizes, 3.2 or 5.0 L, both of which are more than large enough for various dishes. The available temperature and time ranges are pretty standard. Up to 400F and 60 minutes tops. Nothing special, but nice to have. Material choices are equally standard, for the most part. Plastic is used almost everywhere except on some interior parts. The handle like many other fryers is a ‘cool touch’ version meaning it doesn’t conduct heat and stays cool at all times. Again, nothing special, but nice to have. This fryer doesn’t ship with any sort of cookbook, but what it does have are 7 presets for popular dishes selectable on the LCD interface. Also, a rare feature, that the XL, fortunately, does include is a separator for the basket, at least on the larger 5L capacity model. Cleaning is not a chore but the shape of the basket combined with the choice of materials doesn’t make it the easiest thing in the world. However, only good things can generally be said about the actual cooking performance. The taste is just how you want it to be, and chemical leftovers or traces of any artificial flavors can’t be found. There are a couple of flaws gracing the otherwise pretty neat Fryer XL but fortunately, these are all relatively minor ones. First, there’s the price. $120 for a model that barely offers more than fryers that are over $40 or even $50 less? Even worse, the cost inflates to $155 should you choose the larger 5.0L capacity model. Other minor flaws are the gimmicky LCD touchscreen, the glossy exterior surface prone to collecting scratches and fingerprints and more. In conclusion, the weirdly-named Fryer XL by Tristar is a worthy member of this list, just not one of the best. The little fryer tries its best, though and some parts of its design really stand out. The LCD display, whether you think it’s just a useless gimmick or not, is at least something not available from most other fryers and the same goes for the basket sizes—which barely any manufacturers let you choose—and the 6-in-1 feature. You’ll have to decide for yourself whether the Fryer XL suits you. The 33201 Deluxe by Nu Wave is a rather bland fryer. Only by using this fryer do you really learn to appreciate even the most boring aspects of the competition? The concept of the Nu Wave is simple: Combine the most popular aspects of other fryers on the market and put them all into one device. The result is something that has no identity or particular feel to it whatsoever. But are buyers really going to care? Let’s look at the specs. The Nu Wave costs $90, making it a budget fryer. You get a basket holding a maximum of 3.3L, a rectangular touchscreen LED display and that’s about it. A top temperature of 390F is slightly below average, but perfectly okay for all intents and purposes. What is not okay is the total lack of any special features. No separator, no booklet, no baking, sautéeing or anything of the sort. Nothing. What you see is what you get. Even the BELLA 14538, which we derided for its distinct lack of important features had more character and more usability than this. Which, yet again, begs the question: But are buyers really going to care? Probably not as the Nu Wave, in the end, provides the average user with more than satisfying frying performance at low cost. It’s nothing to boast about but it gets the job done. Cleaning the unit is not that easy, but you could simply buy a new one in a few months anyway. The taste is well average really. Nothing special at all. But, as we said, it gets the job done. That’s the important thing here. The Nu Wave’s flaws should be glaringly obvious by now. The truth is that this machine is so incredibly simple and so incredibly bare-bones and spartan that it almost doesn’t do its job. Almost. But yet it works. It works in the way, that it does what it’s supposed to do, not what the competition, that costs the exact same amount of money, does. Maybe there’s a way to appreciate the Nu Wave’s total lack of even the most simple features. We haven’t found it. 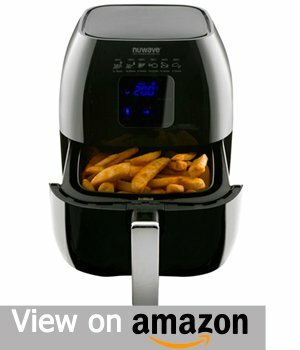 However, if you’re looking for a first air fryer and if you’re on a budget, go for this one. We’re sure you won’t be terribly disappointed. Summarizing, the Nu-Wave fryer really isn’t easy to like. It’s almost impossible to sum this thing up without saying “But hey, it gets its job done”. Because that’s its selling point. That’s the idea behind it. If you have only $90 to spare and for some reason can’t or don’t want to go for one of the higher-quality fryers in this price range, like the Black+Decker model, for example, then go for this one. There’s actually a good chance you’ll be happy with the Nu Wave, especially if it’s your first time using an air fryer. After all, it will get its job done. This fryer simply named “Big Boss” is one hell of a product. Everything from the design to its feature selection is excessive. Let’s start, shall we? You’ll see just what we mean by “excess”. First, there’s the basket made out of thick glass and holding an unbelievable 15L! This makes the Big Boss by far the highest-capacity fryer currently available. Nothing comes close. Of course, there’s also a separator taking advantage of this gargantuan size in order to allow you to cook or fry two foods at the same time. Next, there are the controls. On the metal plate are two large analog knobs used for setting temperature and cooking time. Speaking of these settings whilst the cooking time limit is a standard 60 minutes the temperature setting goes up to 480F almost 100 degrees more than most competitors. There are also some heat and time settings for various foods engraved on the metal face, next to the buttons, for your convenience. The cooking performance is pretty good, too. Nothing really tastes artificial, the cooking itself is faster than on most comparable models and the separator really does separate the flavors of any two dishes you might want to cook at the same time. Unlike most other fryers, the Big Boss uses three separate systems for frying and cooking: Convection, infrared heat, and halogen power. And you can get all of this for only $75, making the Big Boss one of the best air-fryers in terms of its price-performance ratio on our list. So what flaws does it have? It must have some, right? Even the very best contenders on our list aren’t perfect, so let’s take a look. Unfortunately, yes, the Big Boss does have a few weaknesses. Starting with the controls, the knobs aren’t that precise. If you measure the temperature separately, for example, you will notice that there is always a few degrees of difference between what you put in and what temperature actually cooks your food. Also, the Big Boss, thanks to the size and choice of materials, is quite heavy, weighing only slightly less than 7 kilos. And as you may have feared the Big Boss does not come included with any sort of recipe book. Cleaning the unit isn’t that easy, either. So, is the Big Boss fryer for you, then? Probably not. Most people can live without the ability to cook for two entire families in one go thanks to an absurdly large glass basket. Or the option to heat food up to 480 degrees instead of just 400. To be honest, the Big Boss isn’t as practical as it may sound. But hey, for $75, you are getting a truckload of features and generally good quality. Unfortunately, that quality can’t really live up to the standards of, say, Black+Decker. The FZ7002 looks like the experimental in-development form of a fryer that hasn’t been released yet. With strange looks often come strange features, and the T-fal sure has a few of those. From awkwardly placed buttons to a half-transparent basket that’s like nothing you’ve seen on other models, it’s almost as if the T-fal was made to be strange. Let’s start with those buttons. There are two small green ones next to the little monochrome LCD display that tells you information about, temperature and timing settings. The left button is an on/off switch for the entire device, the right one sets the timer in certain increments. It’s hard to get used to at least at first and makes you wonder why they didn’t just use regular knobs. Also, the temperature can’t be manually set. An automatic algorithm matches the heat to the selected time and type of food which can be selected with two more buttons on the lower left and right corners of the T-fal. The basket, on the other hand, is a semi-transparent plexiglass circular casing that goes on top of where your food is. It’s a unique setup and one that only T-fal seems to be using at the moment. Thus the basket acts more like a lid on this particular fryer. It can hold up to 2.9L, which is more than what it looks like due to the fryer’s small footprint and circular shape. Extras include a measuring spoon a colored recipe booklet with 38 recipes and a filter for odorless cooking. Also interesting is the fact that the entire T-fal system was made to be easy to clean. This will surely positively surprise many customers as cleaning has been one aspect many fryer manufacturers typically ignored. The whole package will cost you $115, a mid-range price for a fryer. The downside? Primarily, it’s the controls. The weird button layout T-fal chose really doesn’t feel intuitive, neither does the fact that all buttons are scattered all over the device as far away from each other as possible. Also: No baking. Sorry. And good luck trying to get a pan or pot into that basket with its weird shape and lid-like opening action. 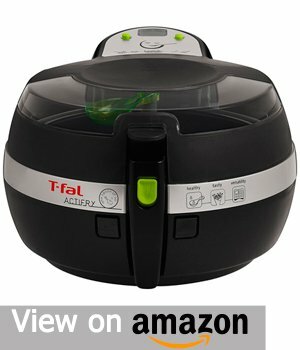 In the end, the T-fal FZ7002 is quite an interesting experiment in air fryer development. Is it a good retail product, though? Maybe. Its cooking and frying performance are certainly okay, but what the T-fal is so obviously trying to get people to buy it with, is its radical styling, the button controls, and the unique basket solution. And those things just happen to be what is wrong with the T-fal. Maybe you should think twice about putting those $115 into this thing. So, which one is the best out of our Top 10? Which fryer beats them all? 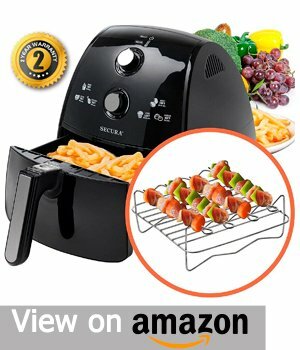 That prize would have to go to the Black+Decker fryer which won fair and square. Now why and how did it win against such varied and interesting competition, some of which even outperformed the Black+Decker in certain aspects? The answer is that the Black+Decker fryer although it isn’t the best at everything certainly beats every other fryer on the market when you take all features into account. Yes, the B&D has its flaws but it performs very well in all of the 4 most important categories above, something that most of its competitors simply can’t do. The cooking quality is one of the best in its class, it’s very easy to clean and maintain. It’s well-built and contains many higher-end materials like stainless steel to boost its longevity and it’s surprisingly easy to use thanks to a simple two-knob layout. It even nails minor points beyond the 4 important criteria like customer support, thanks to a 2-year warranty, or pricing: At just $99, the Black+Decker is not just one of the best. It’s also one of the least expensive fryers. With the B&D, you simply get the most complete, most well-rounded package possible. Yes, some on our list may exceed it in some respects but the Black+Decker fryer clearly shows that the big picture is very, very important. Our top criteria for any fryer on our list generally are cooking quality, taste, cooking speed, reliability, build quality, ease of use and the ease with which one can clean the device. These criteria are important because they sum up what a fryer needs to be for most, if not all consumers. Even a fryer that’s the best at cooking, though, is not worth much if it doesn’t allow you to clean or maintain it. Likewise, a clean-friendly fryer that doesn’t feature a proper timer that you can manually set up is worthless. So even when evaluating based on these criteria, keep in mind that any fryer completely missing any of these, is not worth considering at all. Wattage: The air fryer’s wattage should always be of interest to you. Of course a higher number means a heftier electricity bill but even from a non-financial standpoint you have to ensure that your wall outlet does support the device’s wattage. Capacity: The capacity determines how much food fits into the air fryer’s basket. About 2 Liters should be enough for most people, but think about who you’re going to cook for. Is it a large family? In that case, higher capacities may be necessary. Be aware, though, that the capacity is also indirectly linked to the device’s size. Size: Most fryers are pretty small machines but you should always check the exact measurements to make sure that your fryer will fit where you want to put it. Settings: Temperature and time should both be manually adjustable settings on your fryer. Temperatures of up to 350 degrees Fahrenheit are common and it’s not hard or expensive to get some models that reach 400. The standard for cooking time is a maximum of either 30 or 60 minutes. Think about what kind of dishes you’re planning to cook and what settings you consequently need. Functions: If you need any special features or extras, there is probably some fryer out there that has them. Some models, for example, include a split basket that lets you cook two things at the same time. Some can not just cook or fry but the grill, bake or do even more. You’ll also need to decide whether or not you’ll go with a completely oil-less fryer or one that uses just a little oil. The former is the healthier option whilst the latter might be cheaper. Price: Prices for air-fryers can range from $50 to about $300 but don’t let any price fool you: low price isn’t an indicator for low quality likewise a high price says nothing about the quality (or lack thereof!) of the fryer. Most budget fryers are actually pretty good and can outclass their more expensive counterparts in numerous ways. Programs: Many fryers come with built-in programs for different foods. These can come in handy. For example wouldn’t it be easier to just press one button labeled as “French fries” instead of having to guess and set the timer and temperature yourself? Unfortunately, fryers with lots of programs tend to be more on the expensive side, so you need to carefully consider how much automation you need. Ease of Cleaning: Air fryers have to be cleaned and maintained regularly and that’s a fact. And if your fryer’s design doesn’t allow for any of that it’s a bad one. You should look up reviews to see how easy it is to clean the fryer you’re looking at. No matter which model you choose, you’re going to have to clean it a lot. Non-stick materials: Non-stick materials might not sound like much but they’re a godsend in practice for every fryer user out there. Non-stick materials are simply coatings that reduce surface tension allowing all sorts of food bits dirt or dust to simply fall off of the fryer’s body instead of sticking to it like glue and hardening after a few hours. It really makes the whole thing a lot easier to clean at no additional expense or compromise. Temperature limit & control: How hot you can cook with your fryer is more important than you might think. Generally, for meat, fish or things like french fries up to 350 degrees Fahrenheit should be fine but if you want to roast veggies, for example, higher temperatures of up to and in excess of 400 degrees is a necessity. Having control over the temperature sounds like a given but it’s actually not. Many ‘modern’ fryers use some sort of automatic temperature algorithm where a computer regulates the temperature based on your choice of food and what you set on the timer. Some are even worse and only feature one constant temperature. Many people prefer being able to control the temperature themselves but this is largely personal preference. The important thing is that if you or anyone in your household has a meat-based diet choosing some kind of fryer with variable temperature is a must. Otherwise, you can stick with less expensive static-temperature models. Display type: Many fryers nowadays have LCD or LED displays, few have none and even fewer have their own proprietary display solutions that differ from the norm. Some displays do just that they display information others act as touchscreens and can be used to control certain features. The user experience here is largely up to the user as the feel of touching glass versus turning a knob is highly subjective. You had better try out some similar devices with touchscreens first to see what it feels like to use one. All of these displays are, for the most part, nothing more than gimmicks though. You’ll always be able to save some cash by choosing an old-fashioned model that doesn’t include them. Simply put it is a fryer that cooks/fries with heated air more rarely in addition to infrared radiation or convection instead of with oil. The lack of oil severely decreases the amount of fat and calories contained within the finished dish, which makes the fryer a very healthy option. The health-conscious: Air fryers truly are a very healthy way to cook, fry, bake or do just about anything related to food. Without any oil, the amount of fat and calories that make their way into your stomach drastically sinks making everything you eat healthier. This way people can change their body without changing their exercise plan or their diet. The busy families: Since fryers cook faster on average than deep fryers they’re a perfect option for large busy households that need to get a lot of things done at the same time. Whether it’s packaged frozen or any other kind of food the fryer will get it done in a fraction of the time a deep fryer would need. And they can be cleaned in just a few minutes as well. Those with small kitchens and budgets: People who value space mostly because they don’t have a lot of it, find these fryers to be a greatly helpful appliance as it can effectively replace their toasters, toaster ovens, convection ovens, microwaves and more. Since they also cost a fraction of the cost of all of the above put together, the reasons not to get one when you live in a tight space, such as a college dorm or RV, for example, become fewer and fewer. Now you may ask yourself, “Why should I choose an air fryer when I have this deep fryer already?” That’s a good question. Let’s answer it! Basically ever since air fryers first came out the dangers and negative side-effects of deep frying have only been made more and more apparent. Firstly, there’s fat. Deep frying, unlike air frying, involves quite a bit of oil which in turn makes the food it is subjected to very fatty. Air frying circumvents that by not using oil at all. The fat, of course, is not healthy for your body. Excessive amounts of adipose tissue can lead to obesity, which is a serious health risk that should not be underestimated. But also when you don’t take the fat into account deep frying creates a lot of chemicals and artificial byproducts that eventually land in your body via the food that you eat. Some of these can be very dangerous in larger amounts. Even from a financial perspective, deep frying is not very efficient. As oil breaks down after a certain time when subjected to air, it has to be replaced. The costs for buying new oil add up of course and eventually accumulate to pretty large sums of money. Then the final nail in the coffin for deep fryers is the difficulty with maintaining them even during use. The oil can’t get too hot for too long, for example, so oil filtering with a deep fryer is only possible thanks to some workarounds. But even then you might not achieve the perfect oil temperature which is necessary for the optimal taste. Not to mention the fact that you’re potentially putting boiling hot oil in the vicinity of children which can get seriously dangerous. Basket Air Fryers: These are the most common kind of fryers available. They feature a basket that is inserted into the fryer, containing the food. The basket sits above the electrical coil that produces the heat, which makes the heating and pre-heating process very quick and efficient. And all of that’s possible without any oil! Paddle fryers: These fryers feature a so-called paddle that moves, stirring your food for you. There are both automatic paddle fryers where the paddle moves on its own as well as manual ones where you have to turn it yourself. There are also a few basket air fryers with built-in paddles. Oil-free turkey fryers: These specialist’s fryers are specifically made for cooking up to an entire turkey, be it for Thanksgiving or any other occasion, without any oil. They usually have capacities exceeding 1kg, meaning they’re really large in comparison with other fryers. Of course, a fryer like any other machine is made up of a bunch of different components that interact with each other to make the device work. Every air fryer ever made has these and they all work in a really simple way actually. Let’s take a look. Heat source: Since the fryer’s purpose is simply put to heat stuff up it need something to generate that heat. Almost all fryer’s use an electric coil for this which converts electrical energy from your wall socket into thermal energy or heat. Genius! Airflow: Of course the heat can’t just stay where it is, it needs to get to your food somehow. That’s what the convection system is for. This is mostly just a fan that spins, pushing the hot air into the general direction of the food. Different models have different airflow layouts some really complex with multiple fans, air vents and strange directions the air has to take but the concept always remains the same. Fryer Basket: The basket is where you put your food and it usually just sits on top of the coil. The basket can be coated with a non-stick material and is most of the time designed to be exceptionally easy to clean compared to the rest of the device. There are often holes in the bottom of the basket for the hot air from the coil to get through. 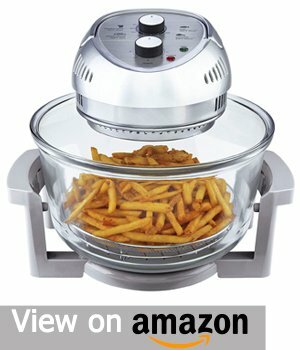 Cooking styles: Air fryers are known for combining the features of many devices into one. Some of the most feature-rich fryers can not just fry, but also steam, roast, grill, bake, and broil. This is only possible thanks to the coil-fan-basket layout employed by the air fryer. Different styles can be used by, for example, changing the speed at which the fan rotates or amplifying the coil. Different baskets may also be available to allow for different styles. Some baskets even support add-ons like pans or pots. Some of the most expensive models can be true Jacks of all trades, pulling off almost any kind of cooking style flawlessly. As long as you know how to use them, that is. It is no secret that deep frying isn’t really the healthiest thing in the world, but now, after the advent of air frying, doctors and nutritionists alike are beginning to realize just how bad it is for your body. Deep fried food has been linked to many things from Type 2 Diabetes to IBS (Irritable Bowel Syndrome), acid reflux and many more. A fryer, being based on a completely different mechanism than a deep fryer, doesn’t have these health risks. Another benefit of choosing a fryer is the fact that it’s compact, quicker than a deep fryer and generally cheaper, as well. Unlike traditional deep frying, air frying can be enjoyed by anyone regardless of their diet choice. Even vegetarians and vegans now choose air frying in favor of other methods because of its simplicity, effectiveness and health benefits. Many different dishes can be prepared: spring rolls, wraps, even something like rutabaga, let your imagination run wild! Without oil, you’ll be missing out on a lot of fat and calories, but we’re sure you won’t regret any of it! 1. Read the instruction manual: This might sound a little too straight-forward, but many people neglect to read the instruction manual of their device, leading to many complications. Remember that the manual was written by the people who designed the device and that they should know best how to handle it. So, before freaking out, at least take a quick look at that dust-catching booklet in the corner. 2. Clean the fryer regularly: Of course, every device needs regular maintenance in order to continue functioning properly. Even our own bodies do! The same goes for this Machine. Don’t forget that most fryers are designed to be really easy to clean, so it’s maintenance should almost never be a challenge. And when you doubt that you know how to properly service your fryer, fall back to tip number 1! 3. Size Matters: Depending on the number of people you’re cooking for, of course. Generally speaking, the size of your fryer compared to the standard fryer’s size should reflect the size of your household compared to the standard household’s. An incredibly famous company mostly known for its power tools, Black+Decker has recently ventured into the territory of air fryers. With great success, too. Secura is a relatively new firm completely focused on creating fryers. They’re specialists in the business and create some true best-sellers. Eastern-European company Cozyna focuses on more luxury-oriented, expensive fryers, often including various user-centric goodies and useful add-ons. A good choice if you can pay the price. GoWISE doesn’t only create fryers, they’re also behind various other kitchen appliances like pressure cookers and even non-food related devices like fat scales. Their air fryers have a reputation for being inexpensive, effective and good-looking. A new marque still trying to find its footing in the market of air fryers, BELLA has already released a handful of fryers so far. Their models are nothing special in terms of features but are generally thought to be reliable and cheap. It was only a matter of time before electronics megacompany Philips would begin producing fryers, and now they are doing it en masse. Their models are generally well-made, using high-quality materials, but they also have a reputation for being overpriced. A young, but relatively well-known company NuWave known for its various kitchen appliances, among them fryers. They have a good reputation, mostly because their models are very affordable and simple. Big Boss, belonging to Tristar, is a new brand of fryers that tries to be revolutionary by including high-end features in very inexpensive products. Will it fail or succeed? Nobody knows at this point. Their current sales aren’t very impressive, though. This brand sells only one eponymous fryer model in the US and Europe and has been doing so for a few years now. 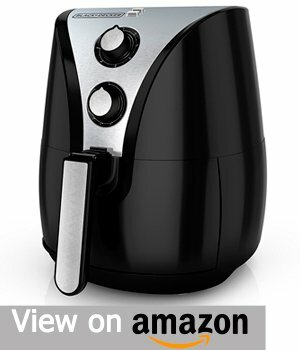 The Power Air Fryer XL is a fairly competent device, not that cheap, but easy to maintain and reliable. 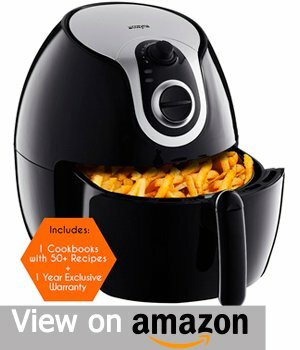 Having read through our overview, you are now armed with everything you need to make a conscious buying decision concerning your future best air fryer. Should you have any questions about this topic, be sure to fall back on our guide. We’re sure the answer is somewhere in here. In any case, we wish you great success with whatever decision you make and whatever fryer you choose in the end! Do not buy the GoWise! Dangerous!! The inner fry basket unexpectedly releases from the outer pan when pulled out to check on food. I have received pretty painful grease burns as the outer basket just drops away, hits the floor, sends grease flying everywhere!! Cracked the outer pan plastic front when it hit the floor this last episode. Bought mine in Feb, 3 months ago but (as I was told by customer service rep via email) the basket/pan/handle is only warranted for 30 days! And she gave me a link to BUY one!!!! If you already have one, be careful. I have gotten into the habit now of making sure there’s plenty of counter space in front of the unit so when I pull out the basket it doesn’t have far to drop. Be careful, you’re playing Russian Roulette with the nearest Emergency Room! Very sorry to hear that. Hope that you recovered from your grease burns now. Will definitely add to my review as this one seems to be a major issue. Thanks for highlighting this as this will help buyers while going for it.